In just a handful of releases, including the publication of Alog’s long-lost Islands Of Memory EP earlier this year, Creaked Records are slowly growing to be a reliable source of excellent electronic music. From the Alpine heights of Switzerland comes Samuel Vaney, who officiates as Consor. Following a first EP released last year, Vaney signed to Creaked. 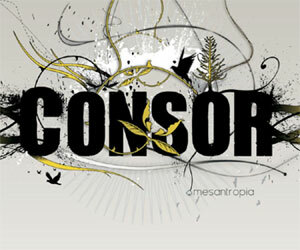 His first album, Mesantropia, reveals a somewhat dark and experimental take on contemporary electronica. Working from field recordings, noises, electronics and samples, Vaney creates here a series of dense and gritty soundscapes tempered with delicate drapes, which he applies onto rarefied melodic formations and develops in unpredictable ways all through the hour long Mesantropia. The album opens with a scintillating music box theme gently underlined with discreet percussions. This apparently innocent piece seems brought to an abrupt end and all the listener is left with is the remaining echo of an evaporated melody. While Aikon sounds too much like a gimmick with its mobile phone interference routine, Monoski is a rather more intriguing offer. Nothing much happens for a while apart from a distant drum beat pattern, but as the beat grows stronger, the background starts filling up, first with deep noises, then with a budding melody, but it is not until three quarters in that Vaney finally releases the tension by suddenly cranking the volume up and sharpening up his knives. While this is undoubtedly a risky strategy, it creates a sense of anxiety which is developed in similar way, although not to the same extent, later on, on Godmorgon. Elsewhere, Vaney plays with sombre soundscapes and assembles claustrophobic pieces. While Valmo’s first half is rather gentle and airy, it progressively becomes heavier in its second half to the point where the rarefied atmosphere becomes almost unbearably oppressive toward the end. Sashimi, Satelitte and Minotaur’s Fall are all dense and thick and only progress through the sheer pressure of their respective weight. Springbok and Niqorb denote a lighter approach, with the former developing around a guitar line while the latter’s intricately woven electronic structure recalls Autechre circa Tri Repetae. If these don’t quite manage to entirely relieve the pressure, they nevertheless provide a welcome breathing space half way through the record and ensure Mesantropia doesn’t veer into absolute paranoia. Samuel Vaney’s first full length as Consor offers an interesting range of atmospheric moments and soundscapes, and his approach to experimental electronica reveals a certain amount of maturity. Vaney carries this album pretty well and maintains a good level of consistency all the way through. While Mesantropia is not original in scope, its execution is pretty much spotless, making it an overall thoroughly enjoyable work.